The combat is basically Darkest Dungeon, but four cells wide, two deep instead of one cell wide, four deep. Lots of push/pull mechanics. Darkest Dungeon combat has a very high, even excessive RNG component to it though. Despite being a quite shallow grinding game, it got positive reviews and 2M sales, things that Barrows Deep will never achieve. i haven't tried it yet, but am I wrong in asuming that darkest dungeon embraces the rogue genre whereas barrows deep does what it can to distance itself from it? Bt trilogy have some rogue elements with the loot and combat, but instead of building on that, barrows deep ditched the rogue elements totally. Rogue games are very popular in their niche because of relayability, and when I look at how much on rails barrows deep seem to be, I can't imagine people wanting to play the game to completion too many times. Something that is going to affect peak numbers as well, as time goes by. They'll still be reporting an income tax filing to Louisana every year, especially since they'll be paying taxes on their payroll itself anyways, and even if they didn't get an income, that just means they'll get more from the credits since none of the credits would go towards what they would owe on income taxes. They'll still be filing, yes, but it doesn't mean that they'll be able to claim credits necessarily. Again, one would have to read in more legal detail what inXile can get out of this without investing back into Louisiana. They're not getting something for nothing, though. And, regardless of how much additional funding they got for the Barrows Deep game from this, it still doesn't change my point that (a) the game has not been well received, and (b) that the amount of money they sank into the game in comparison to the feedback they're getting shows that they made some serious mistakes. Inxile and any other developer are a business, and success for a business is profit. So yes, if a game sells well enough to be profitable, then it is a success. Peak players cannot give you a proper accounting on sales total, you are speculating that it correlates to sales totals and profits. It is an open question whether it is selling enough for it to be profitable. And, as I said earlier, profitability appears to be your metric for success, not mine. I don't know where you are getting the idea that I am trying to correlate peak players to total sales. I told you exactly what I was looking at with peak players and it wasn't that. You're the one speculating about how much subsidization they got from Louisiana to adjust their break even point downwards. didn't they state that they had used 5 times the pledged amount to vreate the game or something like that ? This weekend's peak Steam players was 1,200 down from 2,100 last Sunday according to Steamdb. It's not unusual to see RPG's lose 25-50% of activity after the first week of hype and backer activity. Issue for BT4 is that the starting number isn't very high - which will impact word of mouth sales and general exposure. For a comparison, Wasteland 2 had an 18k opening on Steam, dropping to 12k two weekends after. Pillars of Eternity also had a smaller decline. Positive reviews for the game on Steam are up to 55%. That's a 2% improvement since before patch 2. At this rate, they only need 8 more patches to pass 70%. FYI that '55%' counter only counts reviews in the last 7 days - everything older is discarded for the purposes of calculating that number. So all the day 1 negative reviews are no longer being counted, so those 55% positive reviews are about half on patch 1 and half on patch 2. Unfortunately, by the time this game is what beta testers suggested it could be, it was too late for them to act on it. InExile had to hope for the best. We were brought into the fold too late, the problems we found couldn't be fixed in time. They will largely be fixed in a month - but that's just too late, and it's a shame. It has never been like that, ever. There is All Reviews score and Recent reviews which show the last 30 days, but Recent reviews score does not show up till 45 days after a game's release. It started out as just over all score only for all time, then several years ago they added the recent review score which is the last 30 days of reviews. There was never a time it was the last 7 days. Quick update on game activity levels on Steam (using steamdb) - down to 754 from 1206 last weekend. Fellow Kickstarter RPG Pathfinder: Kingmaker currently sitting on 18,800 following a big opening weekend. I'm no expert, but if TToN had disappointing performance then BT4 is in worse territory. However, it should be noted that TToN's drop-off in players was even more pronounced than BT4. Yeah, despite having half the backers and funding, Pathfinder: Kingmaker is doing fine. "The triumphant return of one of the most iconic RPG series of all-time" is pretty much insignificant, compared to the Russians' steady flow of sales and concurrent player numbers. If you want another data point, my browser-based code wheel tool (which was the first of its kind released as far as I know, and has been widely circulated on steam forums, reddit etc...) sits at a bit more than 9000 views and roughly 6700 downloads. So basically, at least 6500 people worldwide 1) have a copy of BTIV in some form 2) have sufficient interest in the game to want to puzzle out the offerings thing. 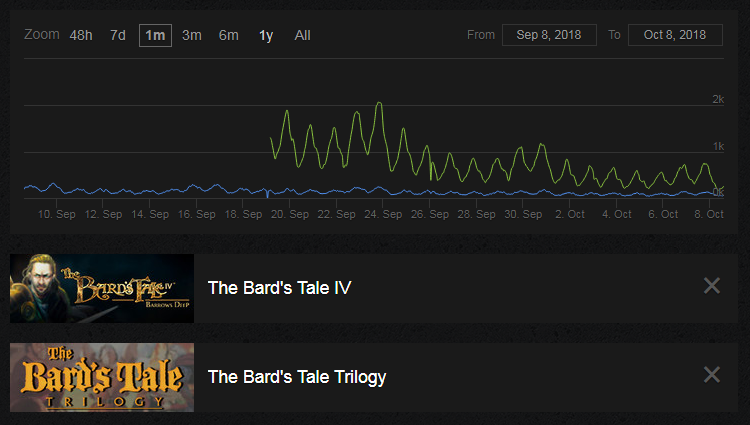 again, inXile were the ones promising to make bards tale great again and the people that keep shouting at anyone pointing out that what they have delivered isn't that great are what would be closer to "trumpians". Maybe you are the one that need to give it a rest since you created a post whose sole objective was to lash out at people you seemingly disagree with. I'm just gonna leave at this. I'm not going to bother getting dragged into some form of forum war. I'm sure people can make their own deductions and have their own opinions on things without either of us trying to tell them what it should be.